Alan Kenneth Head was born on 10 August 1925 to Elsie May (nee Burrell) and Rowland Henry Jack Head. Elsie and Jack had grown up together in Surrey Hills (an eastern suburb of Melbourne). After their marriage, they moved to Bairnsdale in Victoria to run the newsagency there. Within a few years they moved back to Melbourne to take over the Toorak newsagency and lived in residential accommodation above the shop. When Alan was about seven, his father died suddenly. His mother was left to look after three young children (with another, Sybil, on the way) and to carry on running the newsagency. This was the early 1930s and there was a deep depression in Australia as in most parts of the world. To make matters worse, the newspaper companies were reluctant to accept that a woman could run the business. Moreover, the usual protocol for running a newsagency was that next week’s papers had to be paid for in advance. More than once Elsie had to rely on the generosity of friends to help her meet her obligations. One of the perks of children of a newsagency proprietor was that they were allowed two comics a week. Rather than comics, Alan chose Scientific American and Practical Mechanics; possibly a sign of things to come! Alan’s school education was mainly in church schools, but at first he was sent to the Toorak State School. That was very short-term because he ‘came home with swear words’ and was removed immediately. He then went to Christ Church School in South Yarra. When Alan was about ten or eleven it was decided to send him to Ballarat Grammar School on the strength of a recommendation that there was a particularly fine Housemaster there. Alan won a boarding scholarship, which no doubt eased the financial burden on the family. The Housemaster was indeed ‘fine’ and liked to play bridge on Saturday afternoons. Alan discovered that pupils who were invited to make up a four also received afternoon tea and scones with jam and cream. So Alan went to the library and learned how to play contract bridge from books. In fact, all through his life, libraries, self-education and books played a major role. Alan was Dux of Ballarat Grammar School in 1940. Because the education at Ballarat Grammar School only went to ‘Leaving’ level (year 11), Alan had to change schools to do his two ‘honours’ years, which would qualify him to go on to higher education. He won a boarding scholarship to Scotch College in Melbourne and was Dux of Scotch in 1942. Interestingly the Head family’s great-great-grandparents having arrived in Sydney in 1838, had moved to Melbourne in 1839 and settled on the land on which Scotch College stands today. On the basis of his academic results at Scotch, Alan was awarded a scholarship to Ormond College to study at the University of Melbourne, obtaining his BA in Mathematics in 1945 and his BSc in Physics in 1946. He spent most of 1947 tutoring in mathematics at Trinity, another College of the University of Melbourne. In late 1947 or early 1948 he obtained a position as Research Officer at the CSIR Division of Aeronautics. In 1948 Alan was recruited to the CSIR Division of Aeronautics. The Division had established a large experimental program on the fatigue of metals and was gathering data on full-size specimens such as the wings of Mustangs. These were single-seat, long-range fighter aircraft built in large numbers during the Second World War. Alan’s job was to try to assess the data and extract useful information from it. Alan did this in a seminal paper entitled ‘The Growth of Fatigue Cracks’ published in the Philosophical Magazine in 1953. This paper was the first in a book entitled Top Ten Papers 1907-2007 published by the Defence Science and Technology Organisation. Interestingly, the second paper in this book is by DR Warren concerning his invention of the flight recorder (black box), first published in 1954. The invention was a success, but the development was not taken up by Australia. Soon after Alan joined the Division of Aeronautics it was decided that the Division should move out of CSIR and come under the umbrella of the Commonwealth Department of Supply and it was renamed the. In the early 1950s the Department of Supply was keen to bring their staff up to date with work going on in other parts of the world. To this end, they were awarding studentships for scientists to go overseas for up to two years. Alan obtained one of these in 1951 and travelled to England where he enrolled as a PhD student at the HH Wills Physics Laboratory at the University of Bristol. This was the place to be in Solid State Defect Physics, because it was at the forefront of the new science concerning dislocations in crystals, an area Alan recognised as crucial to the problem of fatigue. Alan took less than two years to finish his PhD work. His thesis was on two topics, The Interaction of Dislocations and Boundaries and The Growth of Fatigue Cracks. He was back in Australia when he was awarded a PhD in absentia at a ceremony on 7 July 1954. One of the main influences of this period on his life in the Physics Department of the University of Bristol were the sessions at morning and afternoon tea when senior scientists discussed and explored their topic freely with each other. Alan adopted this practice with enthusiasm and introduced similar informal discussions in all the places in which he subsequently worked. As a former PhD student, Steven Celotto, recalled: â€œThe best time was going to morning and afternoon tea with the rest of the group. It was fun and I learned so much. Alan was the best to learn from; he never talked down to me, but he never spoon fed me. He tried to get me to work it out and if I got stuck he would get me moving again. He tailored his explanations to the person. I learned my physics and chemistry not at the University of Queensland, but at the CSIRO coffee table’. After Alan’s success in producing a theory of fatigue that was able to predict the safe life of a structure and a busy but largely fruitless year spent detailing his new design for a giant radio telescope, it seems that he considered moving on from the Aeronautical Research Laboratories. Word got around and in early 1957 Walter Boas, Chief of the CSIRO Division of Tribophysics invited him to the Division for a talk. Walter was a researcher of the old school and agreed with the maxim of Sir Ian Clunies Ross, Chairman of CSIRO, that the way to run a research organisation was to appoint top-quality scientists in the relevant field and let them decide the topics to study. The job of the Chief was to ensure that they had sufficient resources to carry out their studies. Alan was pleased to be asked to join Tribo, but not even he knew what path his career might take. He called his appointment ‘an experiment’. On a later occasion, in 1980, when Alan was moving from the Division of Materials Science (the old Tribophysics re-named) he wrote in reply to an invitation from Lew Chadderton, Chief of Chemical Physics to join his Division: ‘What would I be doing? The same sort of things I have been doing, whatever that means. I always have been a bit difficult to fit into grand organisational charts, programs and subprograms etc. I suppose because I tend to ‘redeploy’ myself at unpredictable times and in unexpected directions. For the last few years I have been classed as an ‘overhead’, which at least provided some general mirth’. Alan commenced duty at Tribophysics on 8 July 1957. His period at the University of Bristol had equipped him with a knowledge of dislocations to last him for the rest of his career. With a few exceptions, the science of single dislocations and simple interactions of two or three dislocations was either known or calculable. But in the case of ductile metals it was obvious from experiment that extremely large numbers of dislocations are generated and moved by the external applied stresses, and interact not only with each other in huge crowds and entanglements but also with the internal crystal boundaries. So further work on dislocations consisted of examining the stability of arrays and their mobility as a group under applied stresses. Eventually this led to what could be termed continuum theories of dislocations. From 1972 to 1973 Alan produced six papers on ‘Dislocation Group Dynamics’. Towards the end of his career he, with colleagues from the Mathematical Institute at the University of Oxford, produced another series of papers, this time on continuum modelling of dislocations and associated plasticity. However, his next ‘off-track’ activity occurred in 1959, after Alan and Gwen had taken a holiday in Queensland. They were travelling by car on a hot day in the region of the Glasshouse Mountains. They had some tomatoes in the boot that were getting hotter and riper by the minute. Thoughts turned to how to keep them cool. Here the story becomes unclear, but what is certain is that Alan took the problem of how to keep things cool in the Outback seriously. He came up with a design for a refrigerator that required no power. Described like that, it sounds as if he had invented a device for perpetual motion (or at least perpetual cooling) and this led to difficulties when he lodged the patent. The device consists of a sheet of a good thermal conductor (for example, aluminium) coated with a substance that selectively radiates and absorbs electromagnetic radiation at a wavelength of about 10 microns. It so happens that, providing there are no clouds in the sky, there is a ‘window’ in the atmosphere between the absorption band for carbon dioxide on one side and an absorption band for water vapour on the other. This window lies between 8 and 13 microns, so that if a radiator emits radiation at 10 microns it escapes to outer space, the radiator loses heat and cools down. Thus the design of the refrigerator consists of a lid made of a good thermal conductor coated with a selective emitter. This is fitted to an insulated box containing, for example, the tomatoes. The device is placed so that it can see clear sky, but it has to be shaded from direct sunlight. This is because the power of sunlight falling on the surface of the earth when there is a cloudless sky is approximately 1,000 watts/m2 compared to the power of the refrigerator which is about 100 watts/m2. Thus the heating power is ten times greater than the cooling power. This is a difficult hurdle to overcome without high-quality insulation. The lack of cooling power may be one reason why this invention has not been taken up commercially. Another way of enhancing the cooling performance could be to find a selective coating material for the conductor that has a much narrower band of radiation, so that it fits through the window at 8 to 13 microns without any being absorbed at the edges. The refrigerator works day and night as long as the skies are clear. In Australia, peak loads for electricity occur in the summer because of the widespread use of air conditioning. If such a device were perfected and fitted to every house and building in Australia it would make an enormous difference to the amount of fuel used to produce electricity and would reduce the production of carbon dioxide dramatically. Alan Head had many scientific interests detailed summaries of which are provided in the memoir written by Peter Humble (see Source below). He was a mathematical physicist but was so widely read that he could turn his hand to almost anything that had a scientific basis. 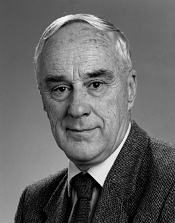 His contributions ranged from a design for a giant radio telescope to writing a computer program to simulate the diffraction of electrons as they pass through a crystalline specimen containing defects on an atomic scale and to calculate the images produced by these defects; from the elastic properties of engineering materials to the aberrations in aplanatic, non-spherical lens systems; from the causes of fracture in solid state materials to the patented design for a refrigerator that obtains its cooling power by selectively radiating electromagnetic radiation through a ‘window’ in the earth’s atmosphere to outer space described above; from Galois theory to quantum computers. Perhaps his greatest success was the theory of fatigue in aluminium alloys used in the construction of jet aeroplanes. Not only was he able to establish the micro-mechanisms involved, his analysis was such that the time that the processes would take to produce a complete failure could be estimated. Without this analysis, commercial aviation as we know it today would have been totally unsafe, whereas knowing the effective lifetime of components and replacing them before the end of their lifetime meant that, provided the relevant maintenance was carried out diligently, travel by air could be safe. The project that gave Alan most pleasure was his understanding of Galois theory and his being the first person to apply it to a practical case concerning the elastic anisotropy of crystalline materials. These two examples epitomise the value Alan put on ‘theory’. Theory was only good if it led to a practical, useful result. Alan Head had a brilliant career but his feet were always firmly on the ground. He was modest, quietly spoken and very approachable. He was a friend and mentor to many. There are more than ten scientific topics described in Peter Humble’s memoir (see Source below) and Alan made significant contributions to all of them. Alan was offered Chairs at overseas universities but always turned them down. The administration involved would interfere with his research and working in Australia was far enough away not to be interrupted by too many visitors. But there were several instances when he did take on an administrative role. When Walter Boas retired, Alan was appointed Acting Chief of Tribophysics until a new Chief was found. He was also appointed interim Chief when the Division of Materials Science joined the Division of Chemical Physics and was renamed the Division of Materials Science and Technology. He was invited to become the founding Director of the Institute of Physical Sciences when CSIRO was grouping divisions into an Institute structure. He declined the offer. He sat on review boards for the Division of Radiophysics and for the Division of Mathematics and Statistics. He served for many years on the Australian Aeronautical Research Committee. In 1968 Alan was one of the founding members of the International Congress on Fracture. In the same year he became one of the editors of the International Journal of Fracture and he only resigned when he retired in 1990. He was one of the organisers of a meeting held on 8’9 October 1996 under the auspices of the Royal Society of London on ‘Vortices, Dislocations and Line Singularities in Partial Differential Equations’. The meeting is recorded in Phil. Trans. of the Roy. Soc. Lond., 355, 1945’2072 (Number 1731). Alan retired in 1990 from CSIRO at the mandatory age of 65, but was given an Honorary Research Fellowship so that he could stay in the laboratory and do what he did best: encourage, mentor, advise and interact generally with the other researchers. In March 2001 he was made an Adjunct Professor at Swinburne University of Technology for three years. Alan was a quiet man, generally of few words. He was an avid reader. His evening routine was to go home, have dinner, put on some favourite classical music and read a book; usually he read one book a night. All his books were borrowed from libraries and when he ran out of books of interest at one library he went to another library in another suburb. I believe he changed libraries four times. As his wife Gwen commented: ‘He didn’t talk much’. 2001 Centenary Medal from the Australian Government for service to research and science. 1976 John Shearer Medal for a paper entitled ‘Earthquakes and Dislocations’ as the best paper for that year presented to the Australian Mineral Foundation. 1969 Syme Medal, from the University of Melbourne in 1969 for the best original research in physics produced in Australia in the previous two years. 1962 DSc, from the University of Melbourne for a thesis on three topicsâ€” Fatigue of Metals; Dislocation Theory; and Geometrical Optics of Aspherical Systems. Humble P, 2010, ‘Alan Kenneth Head, 1925-2010, Australian Academy of Science Memoirs [external link]First published in Historical Records of Australian Science, vol.21, no.2, CSIRO Publishing.